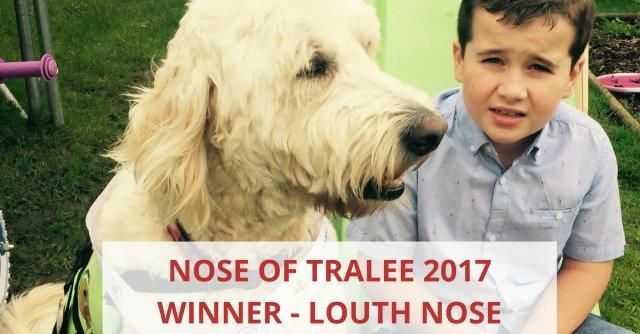 The 4th year of the Nose of Tralee is over and we are delighted to crown another gorgeous pet an official Nose Of Tralee Winner. Every year the competition gets bigger and the excitement, enthusiasm and national coverage of the competition grows. It’s personally a favourite time of the year for me as I get to see people share fabulous pictures of their pets and tell us why their pets would make a great Nose Of Tralee. Our judges work hard each year to select the final 32 Noses and it’s always a great pleasure to get to know them, learn the stories of their pets and see their love for the competition. With over 1200 entries getting to the final 32 county Noses is no small achievement, so I want to congratulate those that made it this year. Seeing all of them in their official Nose sashes is always an exciting time. But, even after over 16,000 votes have been cast there can only be one winner and one runner up. 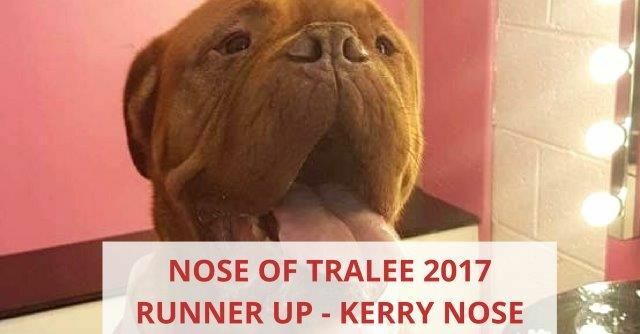 So, I hope you will join me in congratulating the Louth Nose on taking the title of 2017 Nose Of Tralee and the Kerry Nose for being an amazing Runner Up. I really think this ‘Super Dog’ should win as he’s our Hero. Lenny is our beautiful son’s Autism Assistant dog & he’s just fantastic. Daragh who has autism walks every day with him. It calms his behavioural issues down and gets them both out for fresh air. This is NOT a sympathy story… just a Happy Hopeful one. Daragh has major social issues which makes him hard to make friends. As the old saying goes. A dog is a man’s best friend. In this case, it’s a Boys Best Friend. Lenny is one of us. We are a family of 6, with 4 children under the age of 10. Autism is a challenging journey but Lenny makes it less daunting. He is full of life and loves his role as a service dog. Daisy is our 6 year old Dogue De Bordeaux and brings a smile to the face of anyone that meets her! She absolutely loves kids and will quite happily sit and let them cuddle and play doctors with her ? She still thinks she’s a puppy, despite her massive size and weight and would lay on your lap all day if she could. She loves to run on the beach, dips in the mud, and will always find the messiest puddles to lay in. In fact she has it down to a fine art! Her cat sisters love to cuddle in with her due to her gigantic size and she doesn’t bat an eyelid when her sister Roxy the Bulldog lays on top of her. She took a major piece of our hearts when she entered our world at 8 weeks old, and she will do the same with everyone who takes the time to meet her. We firmly believe she would make an amazing Nose of Tralee and we are all so proud of her for representing her county in this competition. She would be donating all of the food she would win to our local animal shelter Kingdom Rescue, to help those animals less fortunate than her. She has the biggest smile and would be so happy to be the face of Pet Sitters Ireland for the year. Thank you to everyone who entered the Nose Of Tralee. We hope that you will join us again next year for our 5th Anniversary where we will be doing something very special to celebrate. Want Early Notification When The Competition Opens Next Year? Want to get early notification next year when the Nose Of Tralee opens for entries? Enter you name and email address below and we’ll let you know once the doors are open!